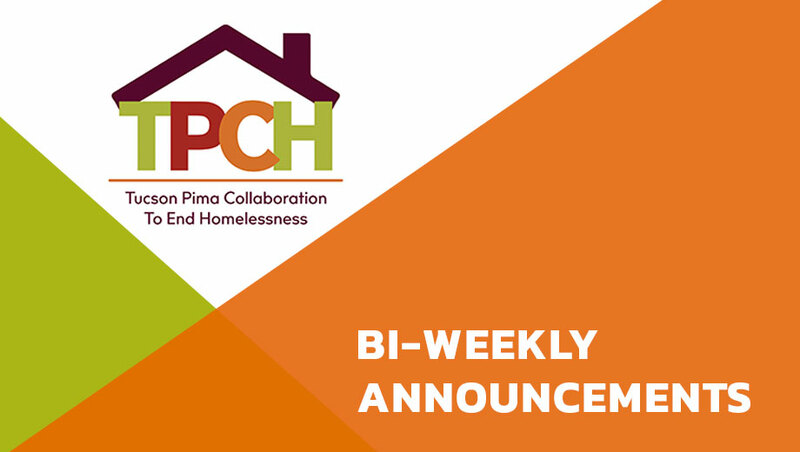 Board of Directors – Tues., March 26, 3:00-5:00pm, Pima County Housing Center, 801 W. Congress St.Outreach Coordination Subcommittee – Thurs., March 28, 9:30-10:30am, American Red Cross, 2916 E. Broadway Blvd. 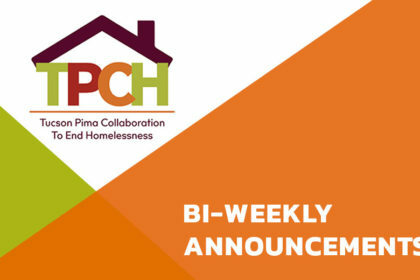 Homeless Youth Subcommittee – Fri., April 5, 8:30-10:00am, GAP Ministries, 2861 N. Flowing Wells Rd. The Pima County Bar Association will hold free “Court Night” legal information sessions on Tuesday, March 26, 4:00-5:30 pm and 5:45-7:15 pm at Flowing Wells Community Center, 1660 W. Ruthrauff Road. · The City of Tucson will become the CoC’s new Collaborative Applicant on an appropriate date as determined by a collaborative transition plan. New and continuing TPCH Board members will be elected at the May 9 TPCH General Council Annual Meeting, 3-4:30 pm, at the Emily Nottingham (Sentinel) Building, 320 N. Commerce Park Loop. · First Responder, Lt. Jamie Brady, Tucson Police Dept. Any TPCH member may send nominations to the Treasurer and the Governance & Planning Committee chair by March 31. Banner University Medical Center and Bombas Socks will aid people without permanent housing and other underserved people Sunday, March 31, 10:00 am to 12:00 pm (noon) at their South Campus, 2800 E. Ajo Way in front of the Behavioral Health Pavilion. The Connecting the Community event will serve breakfast burritos and beverages, and offer free: haircuts; first aid kits; sunscreen, hand sanitizer, dog food; diabetes education; diabetic foot screenings; and help signing up for AHCCCS. See and post the attached flyer.